A state-of-the-art reference, Genetic Mapping of Disease Genes presents a detailed account of the new methodical approaches to gene mapping. It provides completely up-to-date information and comprehensive coverage of research in this field, and includes contributions from the leading experts. 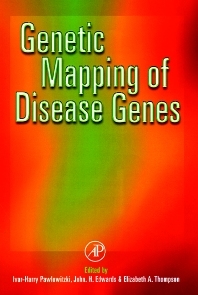 The book gives a broad overview of the genetic mapping involved in inherited diseases and discusses the shortcomings of established mapping procedures. The book will be essential reading for all researchers and postgraduate research students in molecular genetics, clinical genetics, and molecular biology, but also those involved in ophthalmology, public health, medical statistics, and mathematics. Researchers and postgraduate research students in genetics with emphasis on human molecular genetics, clinical genetics, molecular biology, epidemiological genetics, and biochemistry. Individuals in the fields of opthamology, pediatrics, gynecology, psychiatry, hearing research, public health, tropical medicine, blood banking, medical statistics, and mathematics. A.W.F. Edwards, The Early History of the Statistical Estimation of Linkage. N.E. Morton and P. Lio, Oligogenic Linkage and Map Integration. J. Ott, Genetic Mapping in Complex Disorders. J.H. Edwards, Recessive Disease and Allelic Association. T. Grimm, Mutation-Selection-Equilibria, Genetic Models, and Linkage Analysis. D. Stephens and C.A.B. Smith, Simple Likelihood and Probability Calculations for Linkage Analysis.